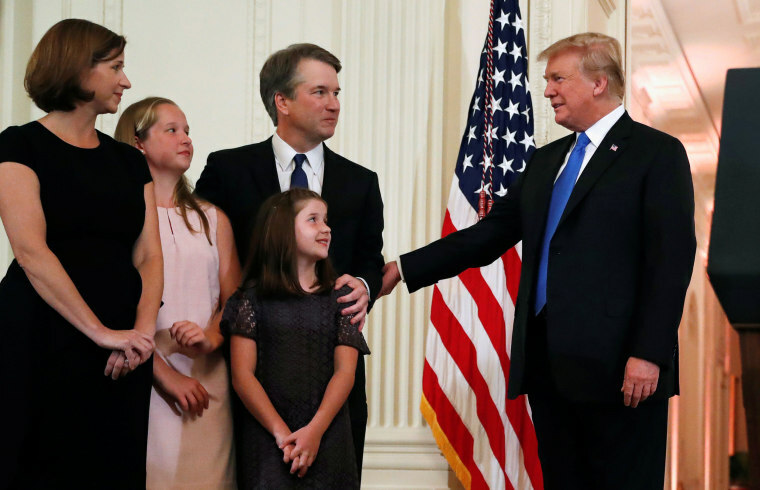 Analysis: President Donald Trump chose not to buck the system with his nomination of establishment favorite Brett Kavanaugh to the Supreme Court. BRUSSELS — Brett Kavanaugh’s nomination to the Supreme Court affirms a peculiar streak in President Donald Trump’s approach to the judiciary: He’s not so anti-establishment when it comes to the nation's highest court. Typically, Trump creates and courts crisis — such as launching trade wars with U.S. allies and rescinding protections for immigrant “Dreamers” — to force action on his agenda items. For better and worse, challenging the establishment is his hallmark. But with the high court, Trump has toed the establishment line — and in doing so, he has unified that part of the GOP with his own political base. That was true when he tapped Neil Gorsuch to join the high court last year, and with his choice of Kavanaugh Monday night. There was no greater evidence of that than the quick praise the pick elicited from former President George W. Bush, who watched mostly from the sidelines during the 2016 presidential primaries as Trump picked his presidency and his family apart. “President Trump has made an outstanding decision,” said Bush, who nominated Kavanaugh, one of his White House aides, to a seat on the U.S. Circuit Court of Appeals for the District of Columbia in 2006. It’s not that Kavanaugh was the safest choice on Trump’s list — fellow Circuit Court Judge Thomas Hardiman won 95 Senate votes for his current job — but he wasn’t the riskiest, either. No matter whom he chose, Trump would have been coloring well within the lines drawn by the conservative Federalist Society given his promise to select from a 25-person docket of judges preapproved by the group. But Kavanaugh is particularly of the establishment. He grew up in Washington; graduated from Yale Law School; clerked for the man he would replace, Supreme Court Justice Anthony Kennedy; worked on the impeachment of President Bill Clinton; and served in the Bush White House before landing a plum federal appellate court appointment — in Washington — at the age of 38. The story of how it took Kavanaugh until he was 41 to take that seat is another indication of just how familiar he is to the D.C. establishment. When Kavanaugh was named, Democrats complained that Bush had picked a “political operative” to sit on a bench one level below the Supreme Court. Knowing full well that he might someday — in the not-too-distant future — become a Republican president’s Supreme Court nominee, they held up his nomination for three years. He wasn’t the only one of Bush’s picks to get caught in the Senate wringer, but liberals harbored a special animus for him and conservatives a special favor. He ultimately won confirmation after the self-dubbed Gang of 14 Republican and Democratic senators came to an agreement that prevented the chamber for several years from overturning its filibuster rule for nominations. In that way, though, Kavanaugh is a comfortable pick for both the political right and the political left — a rarity among Trump decisions. Both sides of Washington’s self-seeking judiciary-industrial complex will pour countless millions of dollars into fundraising, lobbying and advertising centered on Kavanaugh. And because he has a long record as a jurist and political battles both dating back more than a quarter of a century, it will be easier for the right and left to do that work. Sens. Lisa Murkowski, R-Alaska, and Susan Collins, R-Maine, the Republicans widely considered most likely to oppose Kavanaugh over concerns about how he would handle challenges to the Roe v. Wade decision governing abortion, both voted for him in 2006. So did Sen. Tom Carper, a Democrat from Delaware. The only senators who may be discomfited by the choice of Kavanaugh are Democrats in tough re-election races, most of whom won their seats after he was last confirmed by the Senate. That means they don’t have a past vote to lean on as justification for a future vote. This will be new territory for them. Republicans say they are confident that Democratic senators from states Trump won who are up for re-election this year will be hard-pressed to try to deny Kavanaugh’s nomination — even though several voted against Gorsuch. That’s a test Republicans say Kavanaugh is sure to pass. For that reason — and, of course, his record — Washington Republicans are thrilled with the Kavanaugh pick. Usually, Trump is repelled by the very idea of doing anything that pleases the establishment. He likes to be a maverick. But when it comes to Supreme Court justices — a topic that drives his base in the same direction as more traditional Republicans — Trump has shown twice now that he's not interested in bucking the system at all.